MARGARET JOURDAIN, HUME, SOUTHWELL, and BOLINGBROKE enter. Come, my masters; the duchess, I tell you, expectsperformance of your promises. Come on, everyone! I tell you, the duchess is expecting quite a show based on what you promised her. Master Hume, we are therefore provided: will herladyship behold and hear our exorcisms? Master Hume, we are ready for that. Will her ladyship come to see and hear us summon the spirit? Yes, what else would she do? Don't doubt her courage. I have heard her reported to be a woman of an invincible spirit: but it shall be convenient, Master Hume, that you be by her aloft, while we be busy below; and so, I pray you, go, in God's name, and leave u s.
I have heard that she is a woman of an unbreakable spirit. But it might be good if you and her stand above us and watch, while we're busy below. And so please, in God's name, go and leave us. Mother Jourdain, be youprostrate and grovel on the earth; John Southwell,read you; and let us to our work. Mother Jourdain, lay down on the floor and crawl on the ground. John Southwell, you read. Let's get to work. The DUCHESS enters above, with HUME following her. Well said, my masters; and welcome all. To thisgear the sooner the better. That's well said, my masters. And welcome to you all. The sooner this business is started, the better. Patience, good lady; wizards know their times: Deep night, dark night, the silent of the night, The time of night when Troy was set on fire; The time when screech-owls cry and ban-dogs howl, And spirits walk and ghosts break up their graves, That time best fits the work we have in hand. Madam, sit you and fear not: whom we raise, We will make fast within a hallow'd verge. Be patient, good lady. Wizards know when it's the best time. Deep night, dark night, silent night, the time of night when Troy was set on fire, the time when barn owls cry and watchdogs howl, when spirits walk and ghosts come out of their graves—that's the time that 's best for the work we are doing here. Sit yourself down, madam, and don't be afraid. Whoever it is that we raise, we will confine them within the magic circle. Now they do the appropriate ceremonies and make the circle. BOLINGBROKE or SOUTHWELL reads: "I conjure you." There is a terrible thunder and lightning. Then, the spirit rises. Asmath, By the eternal God, whose name and power Thou tremblest at, answer that I shall ask; For, till thou speak, thou shalt not pass from hence. Satan, answer what I ask by the eternal God, whose name and power makes you tremble. Until you speak, you won't leave this place. Ask whatever you want. I wish that I had answered it and could be done with this! [Reads out from a paper] "At first, about the king: what will happen to him?" The duke yet lives that Henry shall depose;But him outlive, and die a violent death. Although the duke that Henry shall depose still lives, Henry will outlive him and he will die a violent death. As the spirit speaks, SOUTHWELL writes the answer. "What will happen to the Duke of Suffolk?" He will die by water. 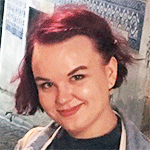 "What will happen to the Duke of Somerset?" Let him shun castles; Safer shall he be upon the sandy plains Than where castles mounted stand. Have done, for more I hardly can endure. He should avoid castles. He'll be safer on the sandy lands than where castles stand on a hill. That's all. I can't take any more. Descend to darkness and the burning lake!False fiend, avoid! Go down to the darkness and the burning lake! Be gone, treacherous demon! Thunder and lightning. The spirit exits. YORK and BUCKINGHAM break in with soldiers. Lay hands upon these traitors and their trash. Beldam, I think we watch'd you at an inch. What, madam, are you there? The king and commonweal Are deeply indebted for this piece of pains: My lord protector will, I doubt it not, See you well guerdon'd for these good deserts. Arrest these traitors and take away their rubbish. Witch, we've been watching you very closely. [To DUCHESS] What, are you there, madam? The king and the commonwealth are very thankful to you for this trouble you have taken. I am sure that my lord protector will see you well rewarded for these good actions. Not half so bad as thine to England's king,Injurious duke, that threatest where's no cause. My actions aren't half as bad as yours towards the king of England, you insulting duke that threatens me for no reason. True, madam, none at all: what call you this? Away with them! Let them be clapp'd up close. And kept asunder. You, madam, shall with us. Stafford, take her to thee. That's true, madam. No reason at all. What do you call all this? Take them away! Lock them up under close guard, and make sure they're in solitary confinement. Madam, you shall come with us. Stafford, take her with you. DUCHESS and HUME exit from above, under guard. We'll see your trinkets here all forthcoming.All, away! We'll make sure that all your silly trinkets here are kept safe and ready to be shown as evidence in court. Go away, all of you! Guards exit with MARGARET JOURDAIN, SOUTHWELL and others. Lord Buckingham, methinks, you watch'd her well: A pretty plot, well chosen to build upon! Now, pray, my lord, let's see the devil's writ. What have we here? Lord Buckingham, I think that you watched her closely enough. It's a cunning scheme, and a good foundation to build on! Now please, my lord, let's see the what the devil has written. [Picks up paper] What do we have here? [Reads] 'The duke yet lives, that Henry shall depose; But him outlive, and die a violent death.' Why, this is just 'Aio te, AEacida, Romanos vincere posse.' Well, to the rest: 'Tell me what fate awaits the Duke of Suffolk? By water shall he die, and take his end. What shall betide the Duke of Somerset? Let him shun castles; Safer shall he be upon the sandy plains Than where castles mounted stand.' Come, come, my lords; These oracles are hardly attain'd, And hardly understood. The king is now in progress towards Saint Alban's, With him the husband of this lovely lady: Thither go these news, as fast as horse can carry them: A sorry breakfast for my lord protector. [Reads] "Although the duke that Henry shall depose still lives, Henry will outlive him and he will die a violent death." This is exactly like "I proclaim that you, the descendant of Aeacus, can conquer the Romans". Well, let's see the rest. "What will happen to the Duke of Suffolk? He shall die by water. What will happen to the Duke of Somerset? He should avoid castles. He'll be safer on the sandy lands than where castles stand on a hill." Come on, my lords, after all this trouble, these prophecies make no sense. The king is now on his way towards Saint Alban's and the husband of this lovely lady is with him. Let's bring them this news, as fast as horse can carry us. It will be a sad breakfast for my lord protector. Your grace shall give me leave, my Lord of York,To be the post, in hope of his reward. Please, my Lord of York, let me be the messenger. I'm hoping I'll get a reward from him. At your pleasure, my good lord. Who's withinthere, ho! As you wish, my good lord. Hey, who's there? Invite my Lords of Salisbury and WarwickTo sup with me to-morrow night. Away! Invite my Lords of Salisbury and Warwick to have dinner with me tomorrow night. Go! Romancikova, Nina. "Henry VI, Part 2 Translation." LitCharts. LitCharts LLC, 19 May 2017. Web. 21 Apr 2019. Romancikova, Nina. "Henry VI, Part 2 Translation." LitCharts LLC, May 19, 2017. 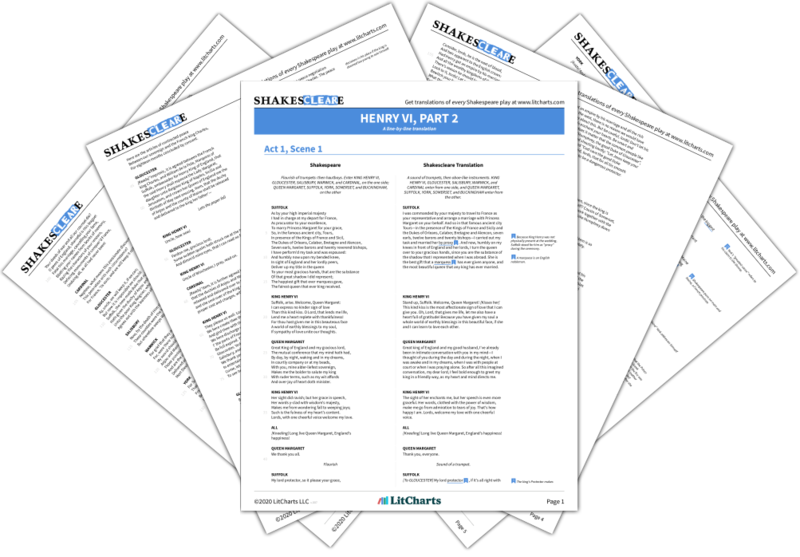 Retrieved April 21, 2019. https://www.litcharts.com/shakescleare/shakespeare-translations/henry-vi-part-2.